I am a writer. I am also a tennis player. (In fact, I have torn the ligaments in my right elbow playing tennis, and in lieu of having Tommy John surgery, I wear a wrist-to-shoulder metal Bledsoe brace on my racquet arm which makes me look like the bionic woman.) I frequently think about what the two have in common–like the need to learn the craft by taking lessons, then putting in hours of painstaking practice, until certain skills become automatic. How many top- spin forehands have I hit in my life? Too many to count. And how many balls did I serve before the ball consistently hit the court in the proper box, let alone where I wanted it? A googolplex, at least. I started as a child. But am I obsessed? It seems that I am not, for when a tennis friend suggested that I write a novel about tennis, nothing resonated. “Anne Lamott has already done that,” I said, referring to Lamott’s book Crooked Little Heart, as if only one novel could be written on any subject. It was an excuse lamer than my right arm, so how do I explain that a sport I’ve allowed to occupy so much time, for which I’ve risked and sustained significant injury, is not an obsession? It leads me to think about subjects that do resonate. A writer friend who sees my drafts before they are published noted that all my books have young women who figure prominently. Another said, “Everything you write is about death.” Yes. Because the one thing I’ve never gotten over is the death of my sister, never mind she died before I was born. So how do my current topics–my historical subjects–draw on that obsession? Both the Darwin and the Einstein marriages and careers turn on a dead daughter. 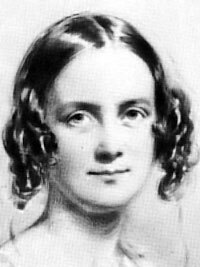 It’s well-known that Charles Darwin’s faith deteriorated at the death of his daughter Annie. 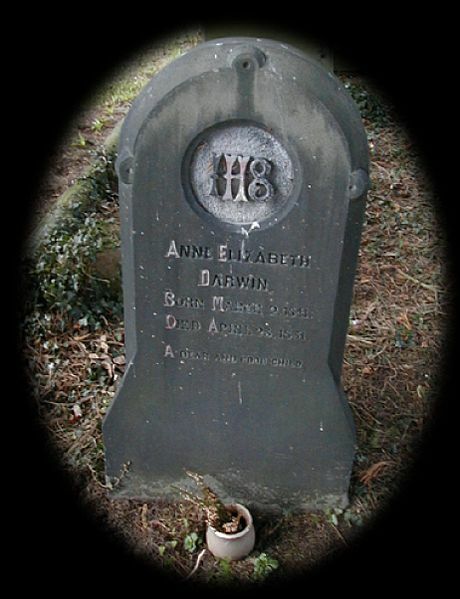 But imagine my surprise when, well into my research for the novel, I first saw a photo of her gravestone. Her name was Anne Elizabeth–my dead sister’s name, spelled exactly the same way. The god of synchronicity was laughing. No surprise then, that Henrietta Darwin, Annie’s next younger sister, has a point of view in the novel. There’s the obsession: how death affects young women. Why young women? Because this is an area of my life where I continue to come of age as I explore what my sister’s death meant to my life. I was the youngest child in my family, but my sister, being the oldest, left her place vacant. I leap-frogged my brother, the middle child, and took over for her, becoming both the youngest and the oldest, carrying on my back a rag-picker’s bag full of ambiguity and identity confusion. So yes, Henrietta Darwin is me. And Emma Darwin is my mother. And yes, my mother really did carry my dead sister’s body around at the wake. I wasn’t born yet. But in the few moments when the subject came up–the subject shrouded in a sacred silence in my household–mother described how she couldn’t let her baby go, how in the years that followed–years she was taking care of my brother and me, both babies, she had trouble covering us up at night when Anne was out in the rain. I don’t remember the context of these revelations. Perhaps it was the day I unearthed an unlabeled box in the hall closet. Inside were my sister’s tiny pink bathrobe, matching slippers, and her well-worn Raggedy Ann doll, called DeeDee Ann. All the best details come from real life. Albert and Mileva Einstein also “lost” a daughter, but the fact was either unknown or obscured until their love letters surfaced in the closet of his oldest son’s wife, the person who cleaned out Mileva’s apartment in Zurich. 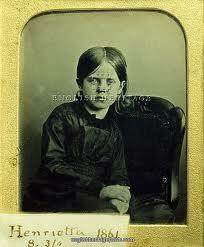 The little girl lived until she was two, at which time she contracted scarlet fever and likely died. But the best efforts of scholars have not turned up documentation of her birth, baptism, or death–either because the shame of her being born prior to their marriage caused Mileva’s father to make certain records were destroyed, or because the records were destroyed in Serbia’s many wars. My novel, as yet, is incomplete. I’ve not yet written the passage where the baby is born. But I know my identification with Mileva is so strong, it takes conscious effort to write Albert’s side of the story. It takes this kind of obsession to sustain the work of writing a novel–the way the work gives back to the author. What obsession is driving the work for you? This entry was posted in Annie Darwin, Charles Darwin, death, Einstein, Einstein's children, Einstein's Daughter, Generating Fiction from History and/or Fact, historical fiction, Mileva Maric, obsession, point of view, reading, Serbia, writing, Zurich. Bookmark the permalink. One thing that informs my fiction is my lack of siblings–exacerbated by the terrible death of my six-years-older cousin when I was three. I don’t know whether I truly remember him or not, but I miss him still. A book will come. (It’s barely started, but it haunts me.) Oddly, as I think of Nancy’s comments about not wanting to write about tennis, I realize that I like to write about skills I don’t possess but wish I did. Consequently, Marie, in the medieval YA novel I’m working on, is not only a skillful embroiderer but an artist with her needle, able to envision and create her own thread paintings. I don’t come close to having either ability. And her twin, Marguerite, is far braver and more adventurous than I could ever hope to be. I think I explore lives I couldn’t live.